For most people in the area, Windsbuhl is a cold spot! This is true, but it doesn’t mean that the grapes cannot ripe very well given the proper viticulture and waiting long enough. Thankfully, the rocky calcareous soil and steep slope provide a good micro climate. The grapes can ripe slowly but surely, keeping a textbook acidity and structure. In 2006, it would have been perhaps possible to let the grapes go as far as in 2005, but we really feared the bad weather and decided to harvest when the grapes looked good! 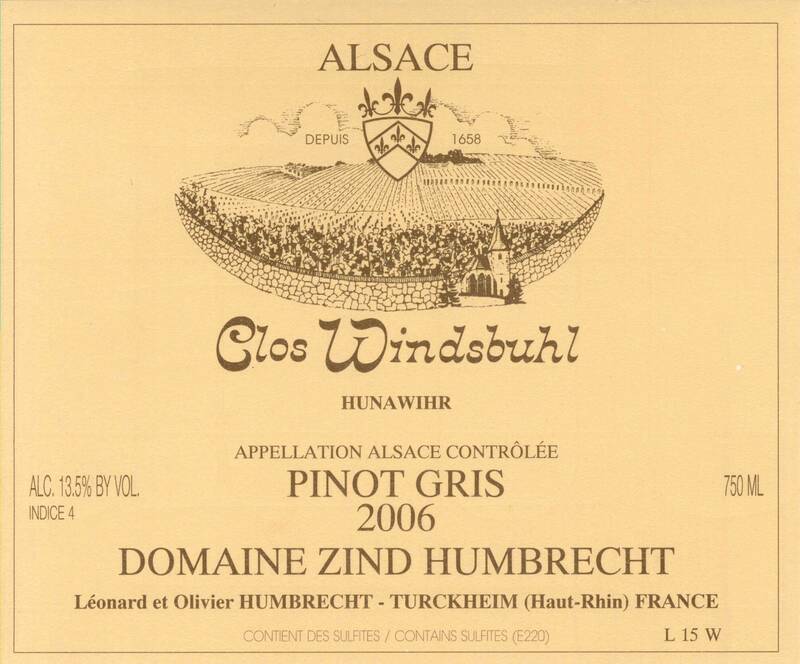 Tasting the Clos Windsbuhl 2006 makes us believe that we took the right decision. The fermentation was very slow (10 months) and the wine found a natural balance in a sweet style. So different from the Riesling! 1/2008: the nose is perhaps one of the most open for a Pinot Gris in 2006: lots of fruits, aromatic herbs, light toasty aromas. A calcareous soil will never produce a fruit bomb, it isn’t in the nature of such vineyard, so there is always a certain restraint aspect in the personality of the Windsbuhl. The palate is delicate, sweet, precisely structured, and not fat and round as the numbers could evoke. Again, this is a wine that deserves some ageing.